The Colca Canyon is considered the deepest canyon of the world, which is more than twice as deep as the Grand Canyon in Colorado. This beautiful landscape is home to the Andean Condor which is a frequent attraction for visitors who watch the condors soar through the air hunting for food. This impressive Canyon was created by the Colca River which starts at Nevado Ampato, an extinct volcano, with a vertical rise of 20,630 feet. 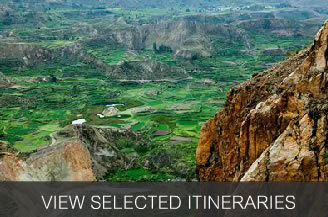 The Colca Canyon is now one of the Seven Natural Wonders of the World for its astounding scenic beauty. A journey to the Colca valley will take you through high Andean plateau, which offers fine views of the Volcanoes of Arequipa. Along the way visitors can see herds of Vicuñas and various types of birds, of which stand out the giant hummingbirds, eagles, gooses and the mighty Andean Condor. 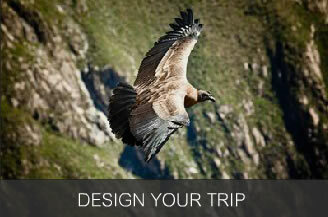 The Canyon is home to the Andean Condor, specie that has been the focus of worldwide conservation efforts. The condors can be seen at close range as they fly past the canyon walls and are a popular attraction. Cruz del Condor: It’s a natural lookout point over the Colca Canyon that is considered one of the best places to witness Condors in flight in their natural habitat. On the way to Cruz del Condor you will enjoy spectacular views of the canyon and will see hundreds of ancient agricultural terraces carved into the slopes of the mountains. Cultural Attractions: They include the Wititi festival in Chivay, named as a cultural heritage of Peru. The Colca is also well known for crafts: goods knitted from baby alpaca fiber and a unique form of embroidery that adorns skirts (polleras), hats, vests and other items of daily wear and use.